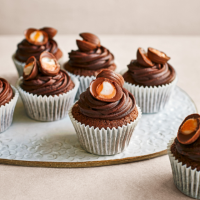 The perfect Easter treat, and so easy to make - follow the simple recipe for gorgeously chocolatey sponges, then top with our ready-made chocolate icing and a Mini Creme Egg. 1. Preheat the oven to 180˚C, gas mark 4; line a 12-hole muffin tin with Cooks’ Homebaking muffin cases. Using electric beaters, cream together the butter and sugar for 2-3 minutes in a mixing bowl until light and fluffy, then beat in the eggs until combined, followed by the milk. Mix together the dry ingredients and sift into the mixture. Beat in gently until combined. 2. Divide evenly between the muffin cases and bake for 20 minutes. Cool in the tin for 5 minutes, then lift out and leave to cool completely on a wire rack. 3. Give the chocolate icing a stir, then transfer it to a piping bag fitted with a star-shaped nozzle (or you can spoon it on if you don’t have a piping bag). Pipe over the top of the cakes. Halve the Mini Creme Eggs by cutting down the join with a sharp knife. Arrange on top of the icing and serve. An ice cream scoop is useful for dividing the cake batter evenly between the muffin cases.